I’m current working on the save game system, which is mostly making sure you can load and save your game properly. That’s pretty boring to blog about so I thought I’d discuss the new skill system in Heroes of a Broken Land 2 instead. Heroes will no longer have a single class, instead they will have multiple “jobs”. A job is essentially a set of specialized skills that a hero will unlock as they gain levels. You could also think of this as a multi-class system. Each job represents a fairly narrow progression path, with a few opportunities to specialize and customize as the hero progresses. I gave some reasons for this change in a previous devlog. We’ll look at two of the most basic jobs in HOBL2: the Mercenary and the Healer. These are two of the most generic jobs in the game so far, most other jobs are more specialized. These roles are so common in RPGs I think they’re make a good introduction to the Jobs system in HOBL2. Note: Skills and jobs aren’t finalized yet, and I expect a lot of changes once play-testing and early access begins, so take the details here with a grain of salt. Strike – Attack twice with your equipped weapon. Offensive Tactics or Defensive Tactics – passive boosts to the Hero’s Attack or Defense stats. Critical Strike or Quick Strike – passive boosts to the Strike skill, either increasing critical damage rate or reducing recovery time when the Strike skill is used. Weapon Training or Armour Training – passive skills that reduce the requirements to equip weapons and armour. Veteran Aura – aura’s are passive boosts that affect a group, in this case a Veteran Mercenary provides a small boost to their allies combat stats. Whirlwind – Melee attack that targets all enemies for multiple attacks. 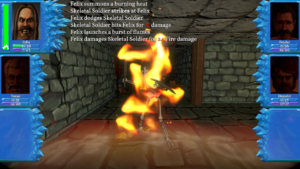 Again you can see the similar pattern to the Mercenary – unique action skills like heal, specialization with choosing Improved Heal vs. Mass Heal, and more powerful skills at higher levels. This forced specialization is meant to enforce the need to multiple heroes and to build parties to deal with specific encounters and dungeons. In the next installment we’ll look at two more interesting jobs the Tactician and the Sage. 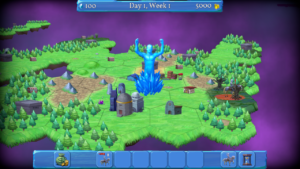 This entry was posted in Devlog, HOBL2 on April 2, 2019 by Andrew Ellem. Now that I’ve announced HOBL2 will be coming out for early access in August 2019, I though it would be a good idea to list what needs to be done before the game is actually ready for the public. This is a pretty high level feature list that needs to be done before the game’s ready to go on Steam. I’ve broken it down to three basic categories: critical must have features, important features that should be there but can be added later if needed and nice to have features that make for a better experience but don’t make or break a release. Many of these features are pretty vaguely described because I don’t want this post to be a 100 line point form list of programming tasks, but instead a view into what I consider an acceptable quality and completeness metric for entering early access. I threw in a % at the end to give and idea of how far along each group is before being ready for early access. The numbers are mostly guesses rather than objective measurements. This list is also not the list for release of the full game. Pretty much everything mentioned is a key feature for the full game and must be done before the game can be considered complete. The list for the full game is much longer and will also evolve and develop during early access. There are still many features and content that won’t be part of early access until much later: non-windows builds, most monsters, most dungeon types, non-human heroes, non-human towns, music and really almost too much to list. Most content creation will happen during the early access period. I hope this post give a bit more details on what to expect later this year, and hopefully lets future players set their expectations for early access appropriately. The last few development logs have been pretty focused on either HOBL1 or some vague high level goals. In future posts I hope to look into more specific development issues and progress. Stay tuned! 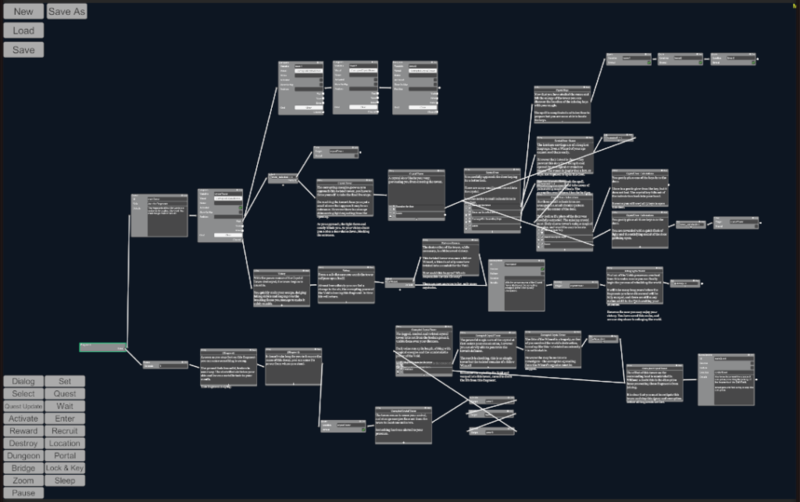 This entry was posted in Devlog, HOBL2 on March 14, 2019 by Andrew Ellem. So I’ve discussed how I think Heroes of a Broken Land 1 was a decent somewhat innovative game but flawed in a number of ways. I’ve also discussed weather HOBL1 was a financial success or not. Now lets look at how I intend to address these flaws and make Heroes of a Broken Land 2 a much better game than the original. Heroes of a Broken Land 2 will still be a procedurally generated game. Each game will have a different world, each dungeon will be new, it’s a core pillar of what makes Heroes of a Broken Land what it is. However procedural generation is both a blessing and curse. It allows you to generate nearly endless variations of worlds, dungeons and monsters. However it can also generate very similar content, and if not careful the content can be too random and generate spaces that aren’t designed for the game at hand. This was a major problem HOBL1’s procedural generation is it was too random. The short explanation is HOBL1 generated mazes and then tried to put interesting content into these mazes. 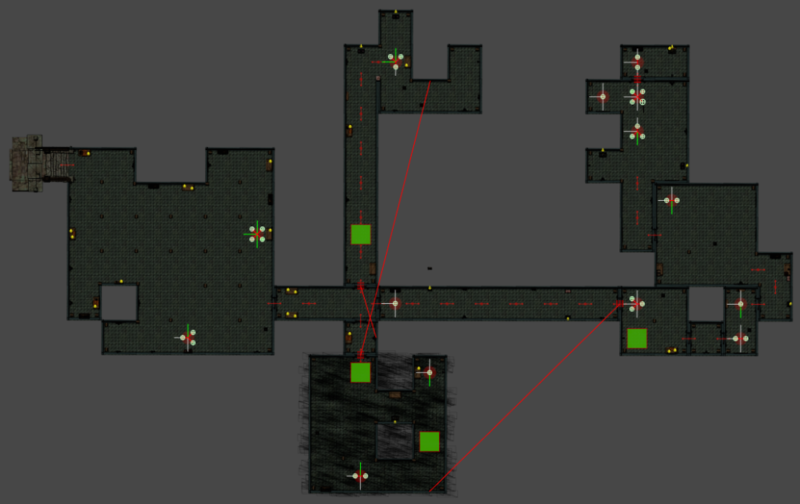 Sometimes this worked, but more often than not it just generated some sprawling random mazes filled with monsters. To overcome this flaw in HOBL2 we first generate a graph that represents to flow of the dungeon. This ensures that each dungeon has a logical progress, a flow from start to end. 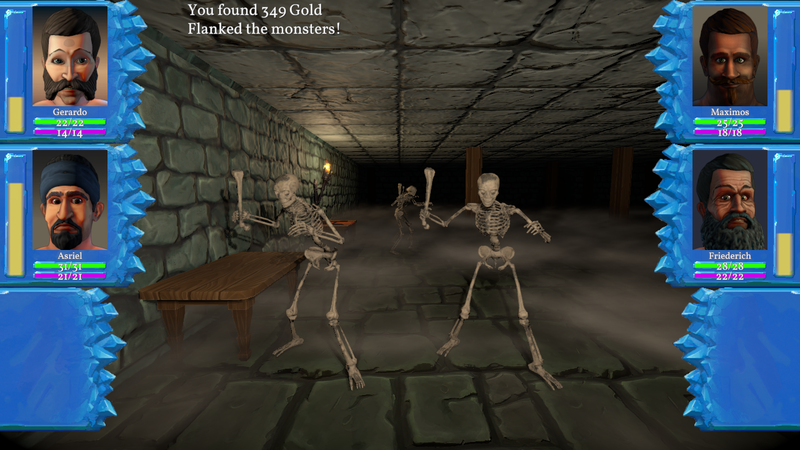 It also allows dungeons to be quest driven and designed from a high level, while letting the procedural generation fill in the details and physical layout of the dungeon. The main world will also be generated in an similar way, as a series of connected fragments you travel through instead of a large single map. This should improve the feel of progression through the word and allow for more variation in world generation. Another way I plan to augment the procedural generation is with the ability to weave custom content into a larger procedural world or dungeon. I’ll have more to say about this in future posts. 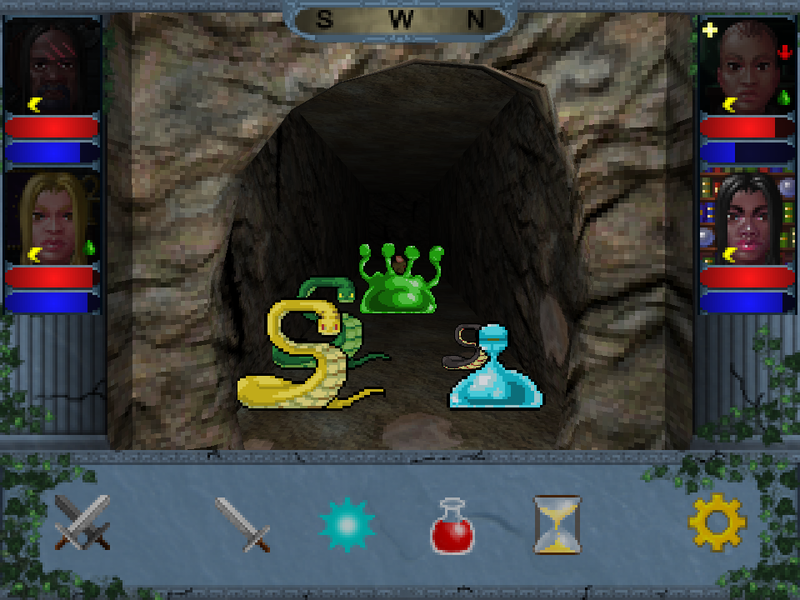 HOBL1 suffered from a poorly implemented quest system. Simply put it was difficult to author quests for technical reasons, and so the game simply didn’t have many different quests. This led to basically performing the same dungeon crawl over and over, which can be fun, but it obviously repetitive. Fixing this has been a personal priority. 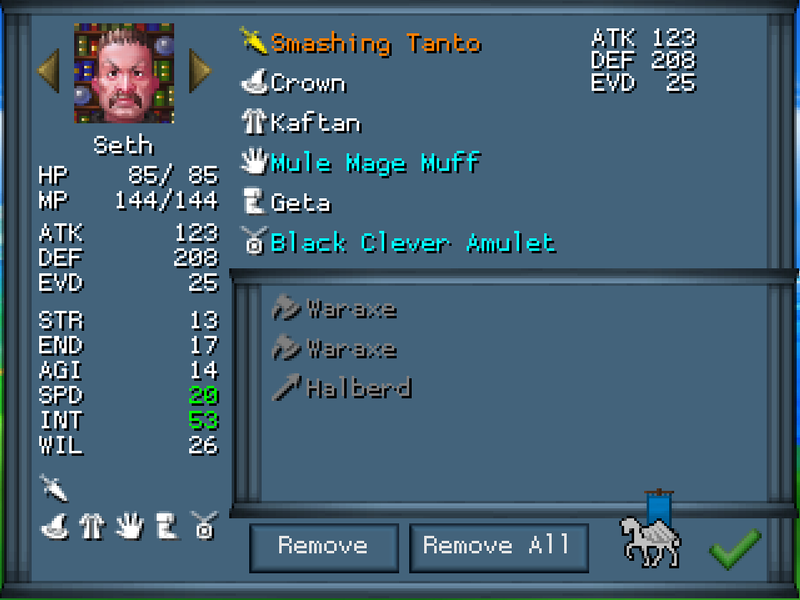 HOBL2 will have an entirely re-written quest system that allows for much more variation through a custom scripting engine. The new system is so much more powerful that essentially the world generation is based on the quest system. The quests define the higher level game world and progression and the procedural generation systems will fill in the detail. This new quest system will be also covered more in future development logs as I have a lot more to say about this and it’s critical to many of HOBL2’s improvements. Heroes of a Broken Land is all about heroes: recruiting them, customizing them, upgrading them and adventuring with them. HOBL1’s flaw was that heroes converged to generic adventurers. That goes against the theme of recruiting teams of heroes to tackle dungeons. Instead you just kept the same heroes and increased their power and abilities to handle any situation. To address the heroes need to specialize rather than generalize. 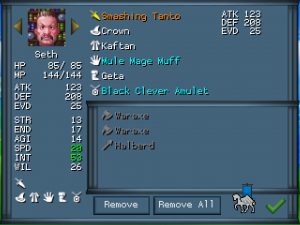 This required a re-design of the whole class and skill system. Heroes will no longer have a single class, instead they will have up to 3 “jobs” (the name may change). Each job provides a mini-skill tree that evolves as heroes gain levels. The main reason for this change is to make each Hero more distinct, as heroes gain levels they will get more powerful but also more specialized. This will encourage different skill and job selection as well as make the use of multiple heroes more desirable. From a player perspective this opens up many more interesting character builds, encourages a more diverse hero pool and rewards trying new combinations of jobs to explore hero potential. Any and every game can use more time. While developing HOBL2 part-time means it does take longer to get things done, it also reduces the pressure to release the game by a set deadline and allows more time . That doesn’t mean HOBL2 will be in development limbo forever, it just means it will get the time it needs. 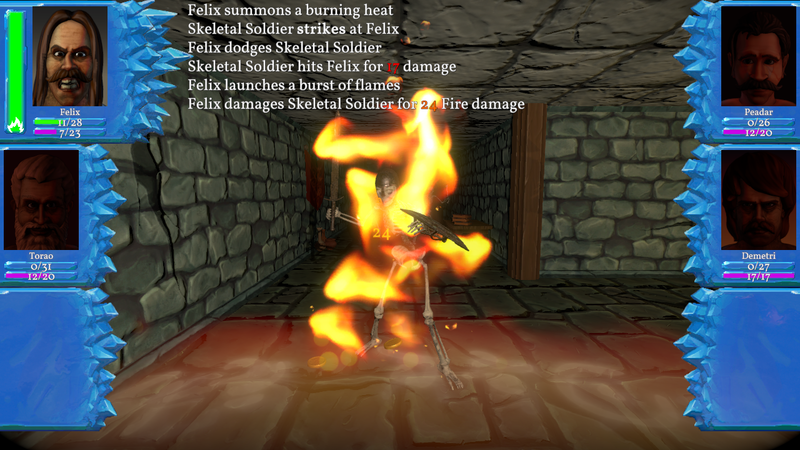 I plan to have the game in early access for about a year, adding content, fixing bugs, polishing the experience and most importantly getting real player feedback. Future development logs will show the current state of the game and focus on more specific development tasks that I’m working on. This entry was posted in Devlog, HOBL2 on February 24, 2019 by Andrew Ellem. After breaking down what I think was successful and what wasn’t in HOBL’s design I’d like to take a look at whether HOBL1 was successful as a product. Regardless of how I feel about the project personally, it was meant to be a profitable game that would enable me to work as a full time indie game developer. The simple answer is that HOBL1 didn’t enable me to do so and therefore HOBL1 was a failure as a game product. I still think it’s interesting to look deeper into why and how it was a failure, because it’s not as simple as “not enough sales”. I also think these stories help inform other indie developers and can help future developers know if a project will be successful or not. Let’s get right to the point: Heroes of a Broken has earned $62,039.10 Canadian Dollars in net revenue since it was first available for pre-purchase in April 2013 (it was officially launched in January 2014). This is number after the resellers (such as Steam) take their cut, but doesn’t include development expenses. Development expenses were about $6,000 to $12000, the exact number depends on whether you want to consider direct expenses only (art & sound) or other stuff like business setup costs, software, hardware, etc. These expenses do not include my time or living expenses. This results in income just over $50,000 CAD. You can see that Steam pretty much dwarfs all other sources. I find it interesting that direct sales are #2 given my lack of marketing or advertising my direct sales channel very well. My records show 12,454 copies of HOBL1 sold in total. Steam’s current numbers are 15,240 total copies, with 10,715 being direct Steam sales. 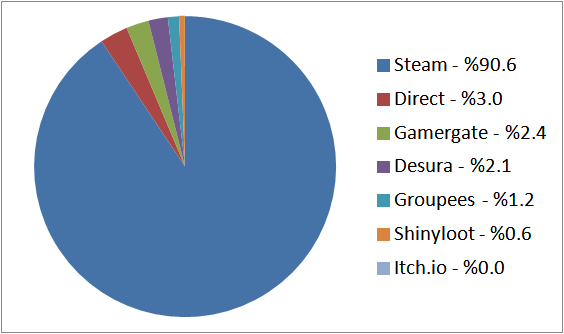 The rest (4,525) are Steam key activations, most copies sold outside Steam came with a Steam key. The average price of a copy sold was $4.98, about a third of the $14.99 full price of the game. Now $50,000 isn’t terrible money, it’s an okay income in many places. If I lived in rural China I’d be pretty wealthy! However where I lived at the time (Toronto) the average family income is $82,859. So it’s not a great income to support a family with, but a decent income as a single earner. It’s much less than I’d make as a full time programmer at a game studio, but given the freedom it might be worth the pay cut. One obvious issue is this is $50,000 over 5 years. Now that doesn’t sound that great anymore. I had set aside about one years of living expenses to develop this project and it had taken a full year to make, so I was running out of money by the time HOBL1 launched. Wow Steam is a big deal, isn’t it? It took almost 8 months from the launch day until it was available on Steam. Back in the day (early 2014) not every game was simply made available on Steam. There was a curated queue of Steam Greenlight games, and at the time only a few dozen would be added each month. So while sales picked up a lot once available on Steam, it took a really long time to get there. 2 months after launch you can see the income drops to almost zero. When your development funds have been spent and your sales dry up, you’re not left with a whole lot of choice. This type of cash flow problem is common for small businesses. At this point I decided to stop full time indie development and started looking for a job. I don’t have any regrets about how HOBL1 went – I’m happy with the game, and I never expected my first full time game attempt to be a giant success, but I did hope it would be able to sustain me while. Looking back I sometimes wonder, did I do something wrong? Could I have done something differently? Had I known HOBL1 would have done that well on Steam, would I have held out? Who knows. The past is past and the industry changes too fast for the specifics of launching my now 5 year old game to matter much. What did I learn from this? A million small lessons in business and game design that are hard to summarize in a blog post. HOBL1 wasn’t cool enough to be picked up by social media. 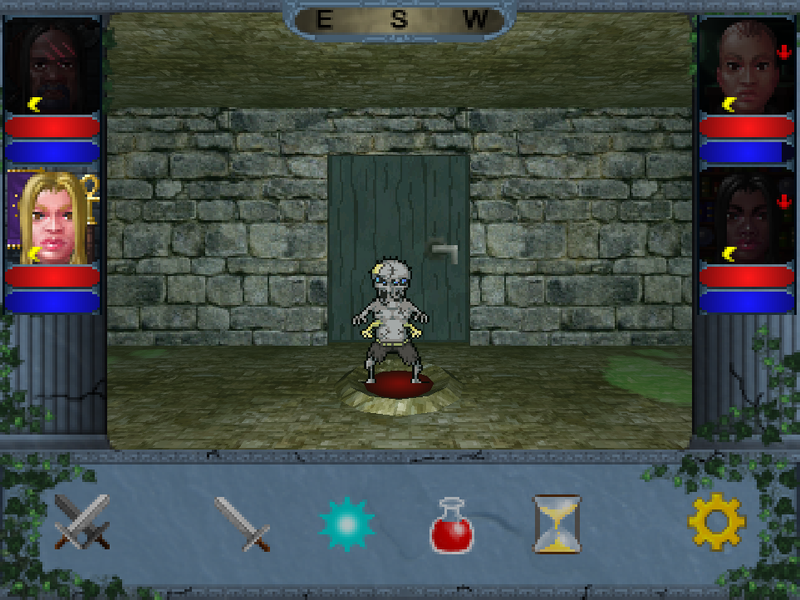 Turn-based first-person dungeon crawlers died 20 years ago. Legend of Grimlock was a fluke not a rebirth of the genre. What does this have to do with HOBL2? Quitting full-time development is the main reason HOBL2 has taken so long come together. Part-time development can be a very slow process, but full-time development is too expensive and risky for me to want to attempt again at the moment. As long as you are patient and tenacious enough part-time is much less stressful. Since the numbers from HOBL1 aren’t terrible, and there seem to be a reasonable number of people who enjoyed the game, I think a sequel has a chance for success. I feel if the game was a bit tighter, more polished, marketed and available more widely from day one it could have been successful. I hope to take my failures with HOBL1 as lessons learned and apply them in HOBL2. However the indie game scene has changed so much in 5 years it hard to say what lessons learned are still relevant. But Enough about money, the next post will be about how I plan on addressing the design issues from HOBL1 in HOBL2. This entry was posted in Devlog, HOBL, HOBL2 on February 13, 2019 by Andrew Ellem. I’m planning on discussing the development of Heroes of a Broken Land 2, covering the various design decisions that go into the game, the work that’s already completed and future development plans. As this is a sequel I thought I would devote the first few posts to Heroes of a Broken Land 1. Specifically what I think went well, what I think didn’t go so well, and how I plan on addressing the flaws on HOBL1 while keeping the sequel true to the goals of the original game. Let’s start by looking at what I think did or didn’t work in the design. 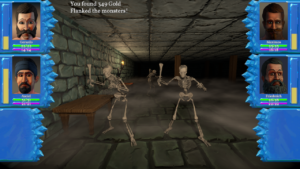 A retro blend up of strategic town building, exploration and turn-based dungeon crawling in a procedural world. I think the high level design – strategic world map with town building combined with retro styled dungeon crawling was a good overall design. I think I pulled off the mix fairly well, providing a nice break between dungeons with world exploration, and controlling character development through town building gave the player a good feel of progression and control. I think multi-party dungeons also brought a unique twist to the game the few dungeon crawlers have tried. Simply put I’m pretty proud of the game as a whole that was developed. I think it was innovative and interesting and am personally quite happy with what I was able to accomplish as a solo indie developer. 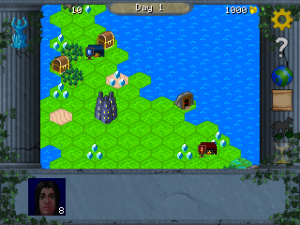 While HOBL1 was inspired by the “games of old” I wanted to modernize the interface and remove tedious time sinks. Some examples of this are the global inventory, shared between multiple parties to avoid the tedium of returning to town after each dungeon. The auto-movement and auto-exit dungeons when cleared options from the mini map helped remove some pointless activities. I tried to not waste people’s time so they could focus on the fun and interesting parts of the game. I think I achieved this and kept the “retro” feel while modernizing the UI. I think I nailed the combat pacing. For the most part battles were quick but deadly, you had to think about your next action, but not too much. I knew there would be lots of combat in this game and I didn’t want each battle to become a long slog. This also carried over into the decision to have almost all attacks auto target based on player and monster position. That decision was a bit divisive, but I think it worked out well and kept combat moving fast. Each activity wasn’t too long or too tedious or too complicated. This was core to making the game engaging and was really the result of hundreds of small design decisions made through development. A lot of what I think went well above started to fall apart later in the game. Some of the fundamental rules and mechanics didn’t scale properly. Monsters got stronger faster than characters, this worked at lower levels because hero equipment would even the stats but equipment stopped scaling too early. This wasn’t the only issue, melee didn’t scale as well as magic making certain builds weaker over time. The result is the pace slowed down at higher levels, which wasn’t intended. The whole class system kind of fell apart too. Letting heroes learn any skill via skill books was fine, it’s fun to upgrade your heroes. However letting heroes to learn any skill without limitation basically broke the class system where eventually you could afford to learn any skill for anyone. This meant that as heroes increased in level they tended to generalize rather than specialize. The game is quite repetitive. While the individual steps of the gameplay loop were basically fun and well tuned you still repeated them a lot, and they didn’t really change that much. A patch released about a year after the launch of HOBL (version 1.10) brought a ton of new monsters and some other content reducing the obvious repetitiveness of fighting 100 rats, but really if you played enough you’d have seen everything eventually. Many other games do have this same issue, and if the core gameplay is engaging enough this doesn’t really matter, it’s still less than ideal and detracts from the overall experience. Procedural generation was meant to help reduce the repetitive feel by creating unique worlds and different dungeons play. But at some level it’s essentially generating more of the same. Some fault lies at the limited content – there were only 3 or 4 types of dungeon art, so everything was bound to look similar, but the generation algorithms were limited and were basically generating very similar mazes each time. HOBL was a very mechanical game. There wasn’t much story other than the intro and a handful of quests. Sure there were some special dungeons and a few unique encounters, but they didn’t really show up until the endgame. Without a higher level narrative or even strong theme tying together much of the game it can make much of the gameplay feel pointless to the player. Sure, there were some limited world events (little stories and mini-quests) that would pop up and provide some text and such but they were also quite limited. Almost all of these quests ended up as a “go and kill everyone” dungeon crawl. There were some reasons for this, some technical and some due to limited time and resources, but ultimately the reasons doesn’t matter: Narrative was a weak point of the game. The unfortunate result is much of the gameplay loop lacked any non-mechanical purpose. No plot progression, no character revelation, no unfolding story. For many people that play RPGs the story is a big part and HOBL1 failed to deliver in this regard. So one nice thing about a procedural generated world is you can make it any size you want. One of my original goals for HOBL1 was to enable the creation of small game so you could finish a complete RPG in a a 4-6 hours instead of 20+ hours. The problem with this goal is I never really tested it until most of the game was completed and I was happy with the pace and core mechanics. Then I tried a small map. 10 hours later I had to go to bed and was nowhere near completing the game. Not even close. So that was a total failure. Sure if you like 20-100+ hour games HOBL can still be a great experience, but the start-to-finish pace was totally broken. 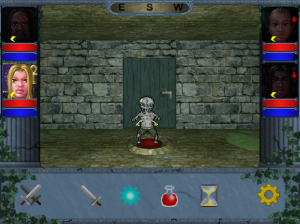 It was also at that stage in development almost impossible to fix without re-doing so much work, especially since I was quite happy with the dungeon crawling and combat pacing. Also, I’d like to point out that if you’re a solo game developer testing a game that takes 20 hour or more to complete is a daunting task. This entry was posted in Devlog, HOBL, HOBL2 on February 6, 2019 by Andrew Ellem. 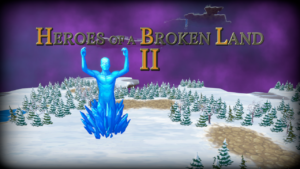 Heroes of a Broken Land version 1.9 has been released. This release includes a number of improvements and content. There is now a equipment screen accessable from any town. This screen should make it easier to manage your heroes’ equipment. Some new objects will now be availalbe in new worlds. The Weaponsmith and Armorsmith will sell a random selection of equipment, which will refresh overtime. The Inn will allow you to recruit wandering heroes, and will also allow you to quickly heal your party, for a fee. This entry was posted in HOBL and tagged HOBL on September 19, 2014 by Andrew Ellem. This entry was posted in HOBL and tagged HOBL on August 29, 2014 by Andrew Ellem.